Fisher Price's MP3 Player For Infants | OhGizmo! Hook’em young, and hook’em good! Stick them kids on an MP3 player at three, and they’ll be yours for life. That’s Fisher Price’s plan at least, if you ask me. See, they’re coming out with the a digital music player aimed at, you guessed it, practically prelingual infants. The name iTod’s being tossed around, but that might be a little risky, legally. A brand extension in the Kidtronics line seems more sensible. In any case, the set comes with volume controlled headphones and parents (or really smart infants) can download songs from an iTunes-like subscription service (see where this is going?). Since the child is not expected to be able to read, the screen will also display icons alongside the song name, like a star for Twinkle Twinkle Little Star. 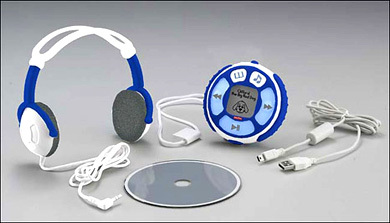 Fisher Price is not the first company to release an MP3 player for young kids. That distinction goes to the Bratz dolls, who released one aimed at six year-olds. But with a growing ?343 million children’s electronics market (in the UK alone) at stake, six year-olds are just… too old. Expect this on shelves this summer, at least in the UK, where it will sell for ?45. Can’t see why it wouldn’t make its way over the pond quick enough, though. This looks really cool for kids but I have a doubt that it would be used more by the grown ups rather kids!